Elkins Tri-Steel is your source for post tension cable suppliers, ready to support your project. We are fully equipped to provide you all the professionally engineered post tension cable you need to successfully complete your project in the most economical and efficient way. Elkins Tri-Steel has grown to be one of the leading reinforcing steel and post tension cable suppliers in the Fort Worth area. Our high-quality post tensioning cable fully meets engineering specification and requirements and offers a great value for your structure. Adaptable to a variety of structures, unbonded post tension cables can be easily, rapidly, and economically installed. Applications for post tension systems include elevated slabs, slab-on-grade, beams and transfer girders, joists, shear walls and mat foundations. Post tension systems are used in areas that are subject to corrosive conditions. 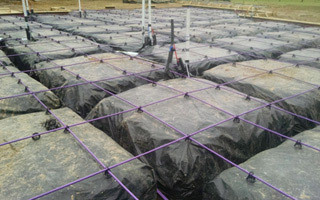 Strands are protected at the anchorages using greased plastic sleeves and grease-filled end caps. Additionally, anchorage components are fully encapsulated in a high density polyethylene plastic covering and an optional encapsulated intermediate coupler anchorage system can be used to protect the strand at construction joints. Basically, whatever it is that you need, we can do it.